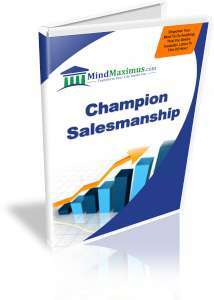 Salesmanship is one of the hardest professional skills to learn. Thankfully, it is also one of the most rewarding. I’m sure you’ve met (or heard of) a few top salesmen in your industry who just seem to close deals as easily as it takes for them to snap their fingers – and almost as fast too! These champion salesmen never seem hit a ‘dry spell’, as they keep getting sales and closing deals even at times when most other salesmen are unable to close a single sale. How do they do it? How do they manage to keep selling when most other salesmen have hit rock bottom in their sales efforts? The secret to their success lies in their mindset. You see, with the right attitude and mindset, you’ll be able to recognize the opportunities that others can’t see. Priming your mental framework for salesmanship success will inevitably attract the type of people who are looking to become your customers. Your subtle thoughts and actions will draw them closer to you, as you begin to realize how easy it is to sell to the people who are looking to be sold to! Are you struggling to meet your sales target every month? Would you like to increase your sales volume by three-fold? …how about more? Have you always wanted to develop the same opportunity-attracting mindset that successful salesmen all around the world possess? No reviews on I05 Champion Salesmanship so far.